The view from my season ticket seats from 2006-2013. Second to only my literal father in terms of importance to my career is Spencer Hall. I first met Spencer at a Jazz Twitter meetup in, I think, 2010. The infamous “lockout is over” 3 AM spaghetti-and-meatballs meal (with the awesome @shandonfan) at Dees followed in 2011. In 2013, Spencer called me and wanted to talk about Salt City Hoops. 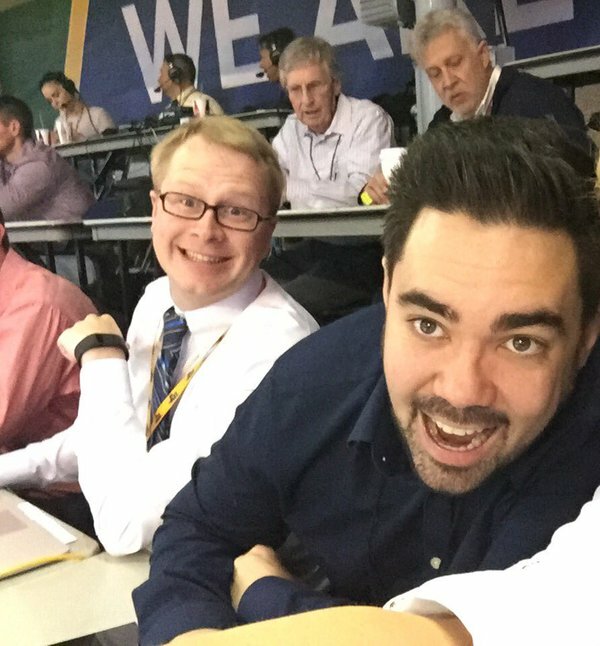 When he offered me the Managing Editor spot, I was so excited: it meant I would have a credential to Jazz games and have a full-time spot on the Salt City Hoops Saturday Show. Eventually, due to his success running KSL.com, his team expanded to the point where he could hire me full-time last May. Spencer is personally responsible for where I am today, and I’m very thankful for that. If he wasn’t successful, and hadn’t believed in me, I wouldn’t be here. I’m very lucky. Thank you to Josh Furlong, my direct supervisor at KSL.com, for his leadership, great ideas on site analytics, and our great lunches at a very small set of locations. Thank you to the fantastic staff at KSL.com (Faith Jolley, Megan Christensen, Natalie Crofts, Angie Treasure, Devon Dewey, Xoel Cardenas, Jordan Ormond, and the departed Celeste Rosenlof and Martha Ostergar) for being incredibly fun to work with every day. I come into the KSL offices every day, even when I don’t necessarily have to, because it’s so much fun to hang out with you guys. 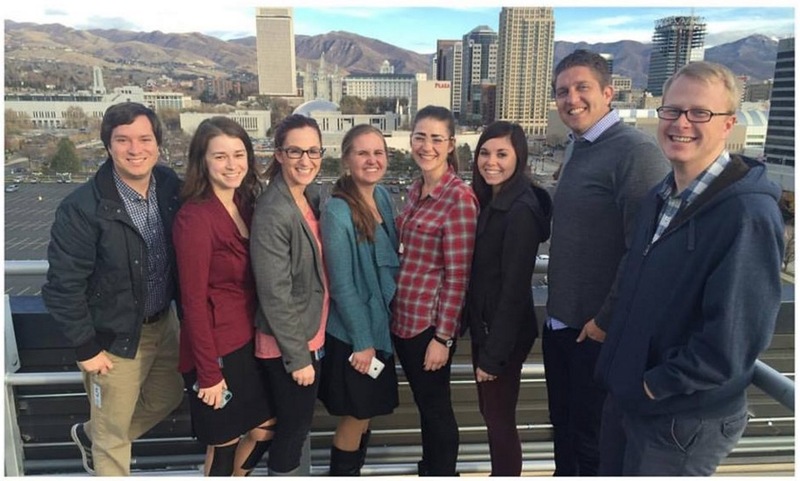 Some of the KSL.com team. Thank you to Sean Walker, my BYU/RSL/everything sports counterpart at KSL.com for doing such a great job at covering all of the bases that he does. It’s unclear how you know so much about even the most obscure of sports topics, but that, plus the sheer number of hours you work, makes you so effective. Angie Treasure has been incredible this year. First of all, she’s one of KSL.com’s best assets, working overtime on running her sections, writing articles, and running the entire site on some weekend shifts. Then, because of her Jazz fandom, I asked her if she wanted to record a podcast with me. Feedback was so good on the resulting product that I quickly made her the regular podcast co-host. 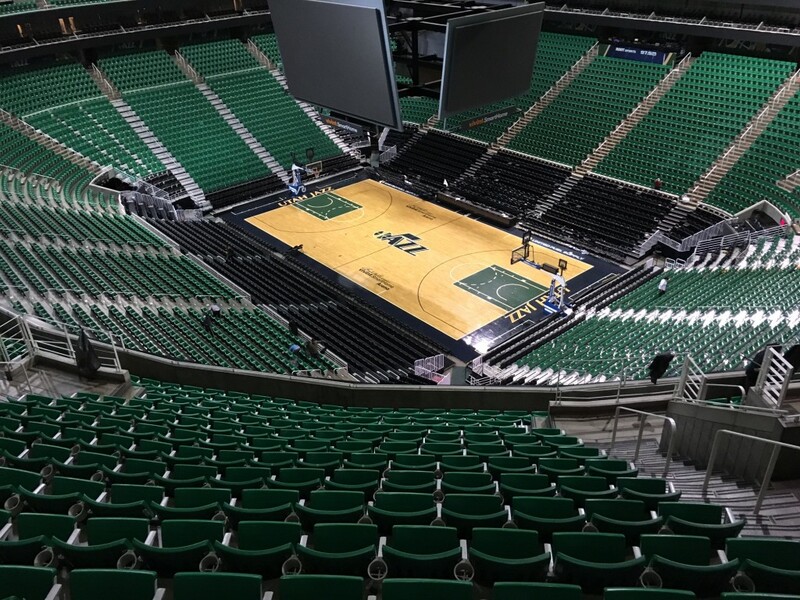 And then, when Salt City Hoops needed an in-town beat writer to cover Jazz home games after that spot opened up, she bravely pointed out that she was the best candidate to give it a try. We tried that, and found out that she definitely not only belonged, but brought a new, unique, and fun voice to the coverage of the team’s games. In short: her ability to immediately step in to any role and then be excellent at it is absurd. Plus, she’s been a stellar friend since I started working for KSL.com. Thanks, Angie. The Salt City Hoops staff has been awesome to work with, all season long. Despite difficult circumstances, their passion for the team and their work shines through, and they deserve massive credit. Dan Clayton‘s Salt City Seven pieces are a top-5 piece of team-specific writing anywhere in the NBA blogosphere. David J. Smith is so well liked because he’s one of the world’s nicest humans and legitimately cares about everybody; that shows in his work detailing each of the Jazz’s 10-day contract signings. Jimbo Rudding‘s mailbags are the weirdest piece of content we publish, as well as the most beloved. If we stopped, certain segments of Utah would riot. Laura Thompson‘s work has been great this year, from the unique perspective of a former team doctor to a psychological study of being a fan. She comes at things from a different angle, which is so nice. Lucas Falk was a fun addition, and I look forward to working with him more. Aaron Hefner‘s 5-on-5s have been great. Clint Johnson does great, in-depth work too when he can. Thanks, too, to everyone on the SCH staff for writing recaps as your availability allows. This is a labor of love for all of you, and that comes through in your work. Thanks to Ben Dowsett for his work with Salt City Hoops early in the year, both on the radio show and as Associate Editor of the website. He was tremendously helpful when he was on the SCH staff, and I thought he dealt with the aftermath of two difficult situations this season really well. Thanks to Dennis Lindsey, Justin Zanik, and Quin Snyder for some fantastic conversations about basketball, from the longest-term picture to the most minute detail, both on and off the record. They’ve exponentially increased by understanding of the game and the Jazz’s moves, and I hope that comes through in my writing and talking. Thanks to Steve Starks, too, for great conversations about the franchise and baseball as well. Thanks to everyone on both the business and basketball side of operations for being so friendly at every opportunity. I want to thank the Jazz PR staff for all of their help this year. I’ve had so many good conversations with Jonathan Rinehart about different aspects of covering the team, and I’ve learned a ton from his guidance since covering the team. Derek Garduno and Caroline Burleson are super helpful too, and fun to hang out with as we wait for the various media availabilities. Frank Zang and Gina Calvert have been very helpful in arranging unique availabilities on the business and event side of the Jazz. Likewise, I want to thank the rest of the Jazz’s media horde. Aaron Falk is the world’s best person to be around, the low-key funniest human I’ve ever met. Jody Genessy is a fantastic writer and well-loved to boot: it’s not an accident he has so many friends from around the country. Kareem Copeland‘s been an awesome friend, guest on our radio show, and difficult-to-defeat chess opponent. Tony Jones is the most gregarious person in the world. He gets stories because he makes friends through his demeanor, and I wish he could be around in all of my social situations. Jasen Lee has been a fantastic foil for triple-digit basketball conversations at the office, he always takes the old-school approach. Ben Anderson‘s great articles for KSL.com and better off-site conversations have been super fun. And David Locke has been a useful outlet for referee rants I can’t share elsewhere, plus has given me some fantastic ideas for things to study. Thanks to Zach Harper for moving to Salt Lake (thanks to Hayley Byrnes for that), graciously agreeing to host the Salt City Hoops radio show with me, for great work on the show, and then for some great segment ideas since. He’s also a tremendous asset in every trivia round. Big thanks to Bill Riley for believing in the Salt City Hoops Show and the passion of our audience, as well as inviting me on his program, Thanks to Tyler Gibbons for walking up to me in 2013 at my first Jazz media day, saying “hey, I like your work”, and inviting me on the ABC4 sports show to talk about it. Through that, he also introduced me to Bill. Thanks to Jon La Follette for producing our radio show every week, even when he has to work both early in the morning producing Tom Kirkland‘s show and late in the evening doing ours. Thanks to Tom for having me as a frequent guest and some good basketball conversations on and off the air. Thanks to Nelson Moran and Nicole Hernandez for having me on their halftime broadcast on Spanish radio every Jazz home game, and for translating my jargony basketball thoughts into easier to understand Spanish. It’s so much fun to do the stats and the “claves” every game with you guys. I think that fun shows in your broadcast throughout. Thanks to my friends for putting up with slow text responses and big gaps in friendship over the course of a busy Jazz season. On the rare occasions when there wasn’t a game or radio show or media event, thanks for finding time to hang out on short notice. Special thanks to Tessie Graham for hosting me in New York City during the Jazz’s road trip there and not kicking me out in the snowstorm despite overstaying my welcome as flights were canceled. And thanks, especially, to Jazz fans: the passionate audience without which all of this wouldn’t be possible. Because you guys are diehards, because there’s no amount of Jazz coverage that you guys think is too much, because you’re all smart, caring, and inquisitive people, I have my dream job, the best job in the world. Tens of thousands of people read everything I write, something that’s never lost on me. Thanks for being dedicated through thick and thin. I owe you each so much.